‘Well done for bringing this to Northern Ireland”. One of many similar comments from the volunteers at our special launch event for ‘Primary Futures’ in Northern Ireland. 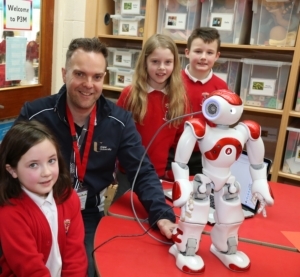 Held at Ballysally Primary School, Coleraine on Thursday 21st March 2019, all the children and teachers from the school were introduced to career-related learning. They met an amazing range of more than 40 people from the world of business, science, technology, food, creative arts, engineering, music, retail, sport and innovative entrepreneurs who had travelled from across Northern Ireland especially to visit the school to talk about the world of work. The visitors shared with the pupils how they use literacy and numeracy in their day-to-day life, encouraging children to think about lessons in the classroom and to make the link between what they can learn and future possibilities. The aim was to broaden children’s horizons, raise their aspirations and challenge the social and gender stereotypes children often have about the people who do certain jobs. The event aims to kick off a national conversation about what more can be done across Northern Ireland to inspire children from an early age. A ‘What’s My Line? activity included: Jenny Bristow (Ireland’s Good Food Ambassador/ Cookery Writer and TV Celebrity), Jonathan Lennox (Nurse) Paige (Fire Fighter), Eddie Johnston (Ice-Cream Maker), Dan Lavery (Surf Instructor and Lifeguard), and Laura Fleming (Overhead Lines Apprentice, Northern Ireland Electricity Networks (NIE)). Coleraine Football Manager (Rodney McAree) came along with the Irish Cup and talked about teamwork and achieving success. The volunteers rated the event as 10 out of 10, with 85% of them commenting that it made them feel that they could make a difference to young people and 70% refelecting that it made them feel they can be part of the local community. In a first for ‘Primary Futures’ a calendar featuring drawings done by the children will be sent into every home on the housing estate with a clear message to parents and carers that children have hopes, dreams and career aspirations that need to be nurtured. 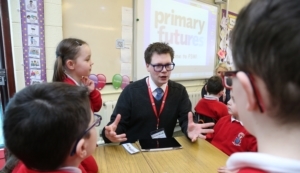 “The Primary Futures event held in Ballysally Primary School was a spell-binding, interactive and inspiring learning experience for everyone involved. 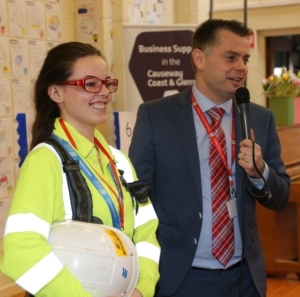 With over 40 volunteers from a range of employments, nearly 300 pupils and 40 parents were encouraged to be curious about a vast range of jobs through the ‘What’s My Line game show’ assembly and face-to-face discussions in classrooms. “Following the event, I had numerous parents tell me not only how much they enjoyed the assembly, but also now that their child wanted to be a… when they grow up. Furthermore, staff commented on how many pupils were now asking more insightful questions linking school work to jobs. 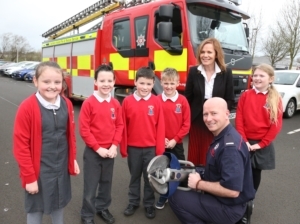 A member of Education and Training Inspectorate witnessed the, ‘What’s My Line’ and saw first-hand the impact upon pupils and parents. He told me afterwards that he, ‘had never seen anything like the Primary Futures concept’ but that it, ‘ticked all the right boxes’ in linking school to the world of employment. We are grateful for the support this event have had, especially from the volunteers who were there and the local press. The Coleraine Chronicle wrote an article that shows the range of volunteers who inspired the children at Ballysally Primary School. Read this article by clicking here or onto the picture below.